This two-disc version of Springsteen's new album features 13 tracks on the CD -- twelve new tracks with the E Street Band, plus the "bonus" 13th track, "The Wrestler" -- plus an additional DVD. 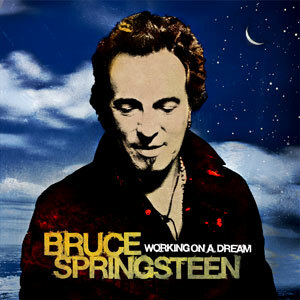 The DVD features a look behind the scenes at the making of a Springsteen album. Produced, directed, and edited by longtime Springsteen associate and Emmy- and Grammy-winner Thom Zimny, the documentary film includes in-studio footage edited to the tracks of "My Lucky Day," "Queen of the Supermarket," "Kingdom of Days," "Working on a Dream," "Life Itself," and "The Last Carnival." Fans may also revel in never-before-heard demos and early versions of various songs as they see Springsteen and the E Street Band at work from a fly-on-the-wall point of view. Order now from Backstreet Records, and get a companion lyric booklet for Working on a Dream, FREE! This is a promotional-only item that Sony is producing in limited quantities. Everyone who orders the CD from Backstreet Records gets one, guaranteed. Click here for the single-disc version of this title.